Aalayam - Colors, Cuisines and Cultures Inspired! : Cheap and Easy - Kids' Room Decor! Cheap and Easy - Kids' Room Decor! I had twins! I never expected that. I'd always been fascinated by the concept of twins. My best friend Hari, is a twin. And imagine my surprise and disbelief when the ultrasound tech, suggested that what she thought was an artifact in the scan, could very well be another baby!! Whew - a whirlwind of emotions, mountains of diapers, and eons of sleepless nights later, my girls are almost four now and spouting opinions ranging from cool nail polish colors to ways to disagree with people without hurting their feelings! Ahem. And, opinionated as they are, it is challenging to design a functional, stylish, captivating play and stay space for them...and still stay within budget! Today's post is about designing a kids' room on a dime, and still letting the room grow with your kids! 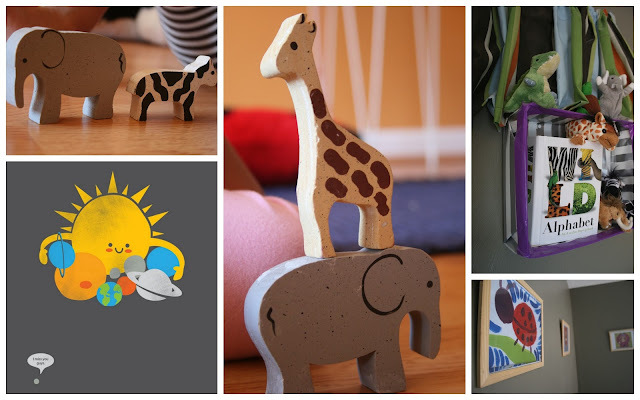 Cheap and Easy ways to make your kids' room fun, educational and sustainable..
Bring in sustainable toys like this wooden animal set, use colorful pictures you found on the internet to adorn inexpensive wooden frames, use imaginative wall art...go crazy in your kids room!! First of all, do NOT buy furniture for your kids room. Couple of reasons. You do not want to spend money on two cribs, two chest of drawers, two changing tables (one of each if you are having one baby) etc etc..AND risk your kids falling off the changing tables, or bumping into furniture or outgrowing the chest of drawers. In fact, when it comes to design, it is perfectly fine to be a little non-conformist. If the baby magazines and the HGTV shows are preaching for you to BUY stuff that your kids and you will definitely outgrow in size and style, then, don't listen to them. That is why I did not buy also, the bottle warmers, boppy pillows, bouncers, rockers, walkers and a myriad of other baby stuff that clutter the baby stuff landscape and move to your garage in a jiffy! This is what I did, I made the whole room floor level. The bed (our old queen mattress laid on the floor), the reading nook, the play area - so as infants learning to crawl, or as toddlers learning to walk, my girls always had a "level" playing field!! And now, as lil imaginative storytellers, they have their play nooks in different corners of their activity room (I am using our formal dining room as a day activity room for the kids) and bed room. Plus, all the sitting down on the floor and getting back up again (think Padmasana folks!) while changing or dressing or playing with your baby(ies) is FANTASTIC exercise for the post-partum figure. No wonder I fit into my pre-preggers jeans 2 months after the girls were out. Ahem again! Not investing in furniture has helped me keep my kids room fresh and timeless by constantly rearranging the layout of the room to suit my and my kids' fancy. A bunch of colorful carpets, tons of softscaping in the nature of toys, pillows, floor cushions and cozy blankets - Voila! You have a room to suit any child's fancy. It is important however to use a solid neutral for the wall color, so you don't outgrow the baby pastels as your lil ones get not so lil! The only piece of furniture in the girls' room is an up-cycled book shelf, which I have got Dad to nail onto the wall. I have used colorful bins to line the shelves. In these bins I have put the girls' daily school clothes, toys, books and other essentials that they cannot live without. This shelf acts as a easy and functional way for me to store things outside of the designated closet. Now that we have the living arrangements figured out, lets talk about how we keep the girls engaged in our house, during the evenings, interminable weekends and the occasional sick days! And yes, and how YOU can create that play space to keep the creative juices flowing. Without having to turn on the TV!! 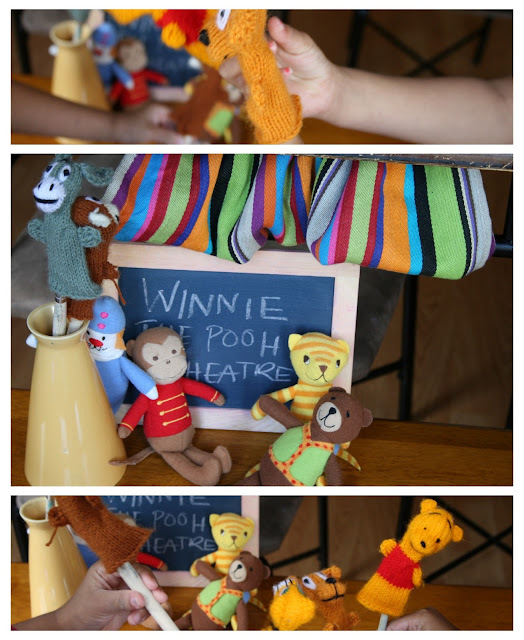 Theater puppet shows with handcrafted Winnie the Pooh puppets and some Circus friends thrown in! Incorporating imaginative play into everyday fosters a creativity, improves kids' vocabulary, and of course keeps them off the couch! I swear by play acting, finger and sock puppets, dance and drama to keep my young uns positively preoccupied. For the Winnie the Pooh tableau above, I used handcrafted finger puppets from Germany (thank you microbiologist sis! ), conveniently used as props on paint brushes and Circus pals from IKEA, in a homegrown stage setting with some table napkins and chalk board! p.s. I really wonder, how I would have raised kids without the friendly neighborhood IKEA! 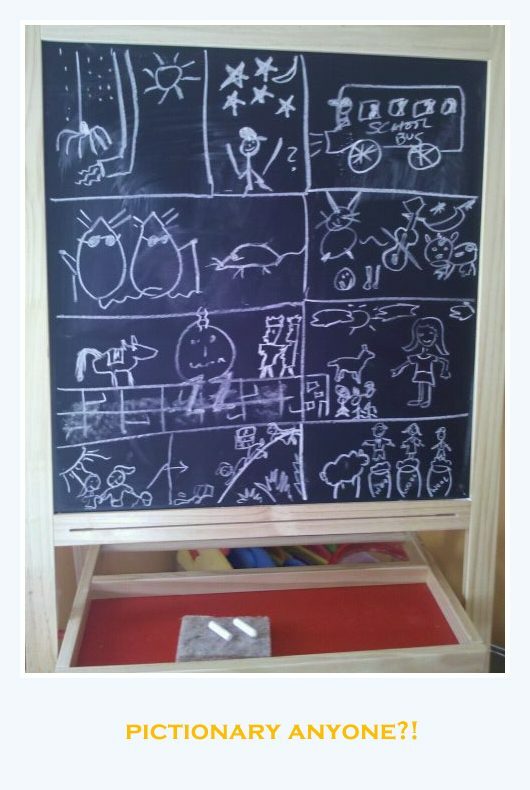 Pre-school at home! Why not? Just get all the resources ready for everyday teachable moments! We also make sure that our day room (also known as the activity room) is full of inspiration and incentive for these lil rascals to read, write, count and basically have tons of fun! Check out the abacus, the chalk board which also doubles up as a white board on the back, the wooden desk and chairs and loads of educational toys, which stimulate their tactile and cognitive learning. And of course, don't forget to nurture the artist! You may have a budding Michelangelo in your own home! So, stock up on never ending supplies of paint brushes, paints, card stock paper, crayons and markers! We have spent many a rainy afternoon in our activity room journalling about what we saw in the garden that morning, or recreating scenes from "Jack and the Beanstalk" and "Hansel and Gretel". I want to share a cool idea that I have incorporated throughout our home, especially in the kids' rooms to showcase quirky toys and childhood accents. BASKETS!!!!! Mounted on the walls, they act as transient and eye catching shelving! And when you are ready to change the flavor of the room - this room you see above is actually a formal dining room, you have no major renovation or furniture moving necessary. And you have BONUS gorgeous baskets to add to your accent stash!! WIN WIN! The next big ideas I am toying with for the kids' rooms are a chalkboard wall (think Starbucks coffee shops), and a miniature theater replete with retractable screens, spotlights and wings! I need to do it quick, before they outgrow the imaginative play stage! In the meanwhile, I gotta lot of studying, learning and practice to do on the science of parenting. As I am sure you all agree, I am playing it by the ear at the moment. But, hey - whatever works right?! Do share your parenting (and kids room design) conundrums! 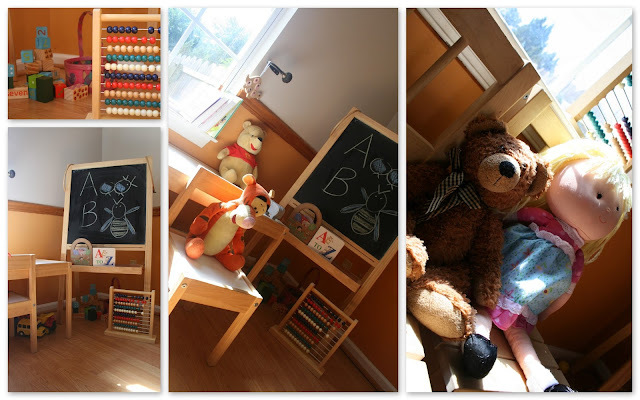 I would love to hear how you handled creating a functional, easy and educational space for your kid(s), while maintaining sanity, control and smiles!! Do tell!! Ambika! Thank you. And I totally loved the 6 month to 1 year stage of my girls. That is the cuddliest, coziest and the quietest stage. I remember once that one of the girls, learning to stand up, had tumbled off the 2 inch high mattress onto the floor!! She rubbed her nose and moved on. I remember thinking, if that was a crib or a bed she had tumbled off of, I would have to be rushing to the ER!! Thank you Disha. Parenting, as I am sure you agree, is a constant challenge of how to make everyday interesting for already bored kids!! Imagine how teenage will be! Thank you Sridevi. Taking a page off your book only. Thank you!!! I will make sure the next redecorating project will unfold when you are in town!! Absolutely beautiful Supriya, The grey on the wall & pine coloured chair & table looks soo cute. Thanks for dropping by @ my blog! my home was featured at ColoursDekor couple of years back. But would send the pics, you take a call about feature! Thanks again for asking! Thank you for your feedback, As I said, you have a great eye for color and photography, so if you like my post, I am pleased! I would love for you to send the pictures from your home over to aalayaminspiration@blogspot.com. I am looking forward to it! Thank you for dropping by. I would love for you to keep coming back!! I just got alphabet wall decor from World Market for the girls and have put respective alphabets over their beds. It adds that pop of color! I will share the picture with you! Also, good luck on redecorating the space for your kids. Am honored you got inspired by this article. I will definitely close the loop with you on the theatre decor as it happens! !